The main source of light is from the rising sun, from the right of the cartoon, which adds a yellow hue to the scene, particularly on the wall behind the figures. 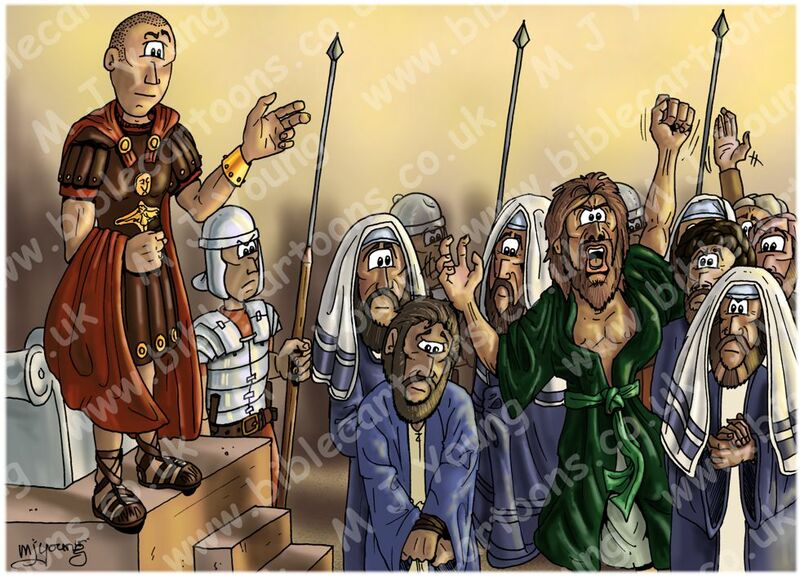 Pontius Pilate (standing on the wooden dais) with three Roman guards or soldiers in metal & leather armour, carrying spears. The crowd of Hebrews: the leading priests, other leaders & teachers of religious law—the entire high council (or Sanhedrin) with Jesus bound before them, in the foreground. Barrabas, wearing a green outer robe. Only a few moments have passed since the previous scene: enough time to release Barabbas to the crowd. 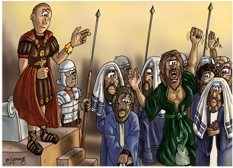 We see him (Barabbas) defiantly shouting & punching the air, as he is released. Notice Jesus expression: downcast, resigned, pained, as he awaits the cross which he knows is before him.